Oh my god, are we sore! Haven’t done this much cycling in a while so it took us a while to get going but going we did. And not only the next day but even that first evening. Being way out in the country and not equipped to prepare our own meal we cycled another 4km one way to the local town for a dinner at a hotel. Satisfied with dinner we cycled, downhill, and back to the gite for a great night’s sleep but morning came to soon and we had to get our butts back into the saddle and move on. The canal path for the first day and a half was in pretty good shape as you can see above. There were not many instances of seeing a paved section most being hard packed gravel. 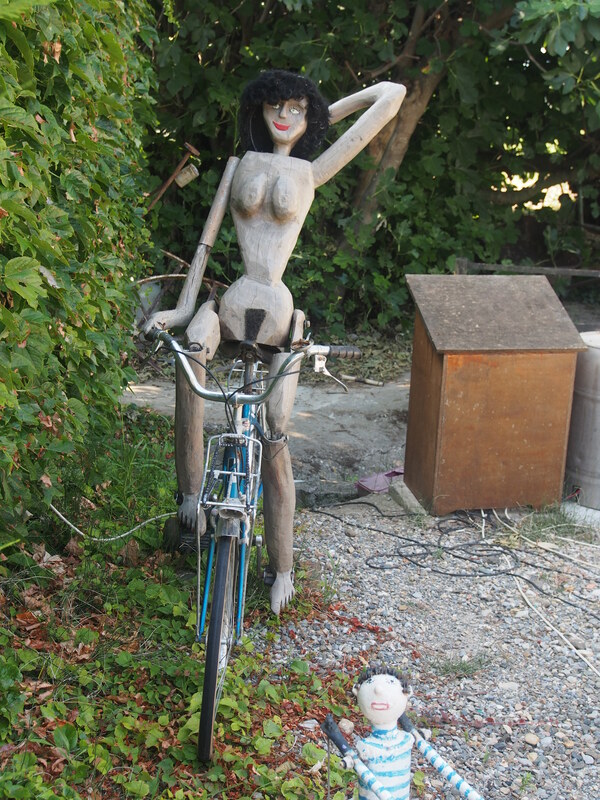 The first few hours on the path were quiet with very little traffic on either the bike path or the canal. As late morning arrived we saw more cyclists, walkers, strollers and fishermen. The canal traffic was always quite light. There is no commercial traffic on the canal other than the tourist boats working out of the major centres taking people out on a day trip. The majority of the other traffic on the canal were rented canal boats with a very small smattering of sailing yachts transiting from the Mediterranean to the Atlantic or vice versa. The above picture shows a sample of one of the many locks with two pleasure boats getting ready to move through one set. 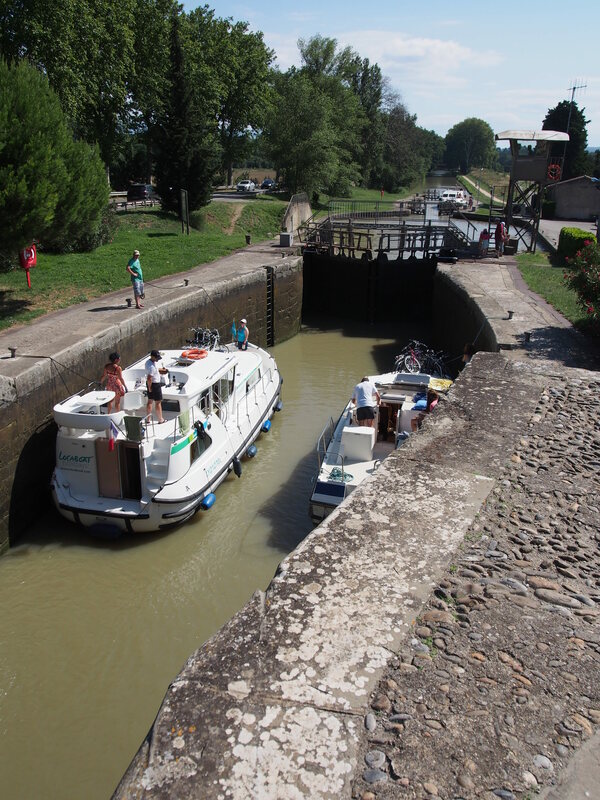 The canal as a whole is an example of an incredible engineering feat running a distance of 241km from Toulouse to Sete, on the shores of the Mediterranean. Commissioned in 1666 it was finished in 1681. 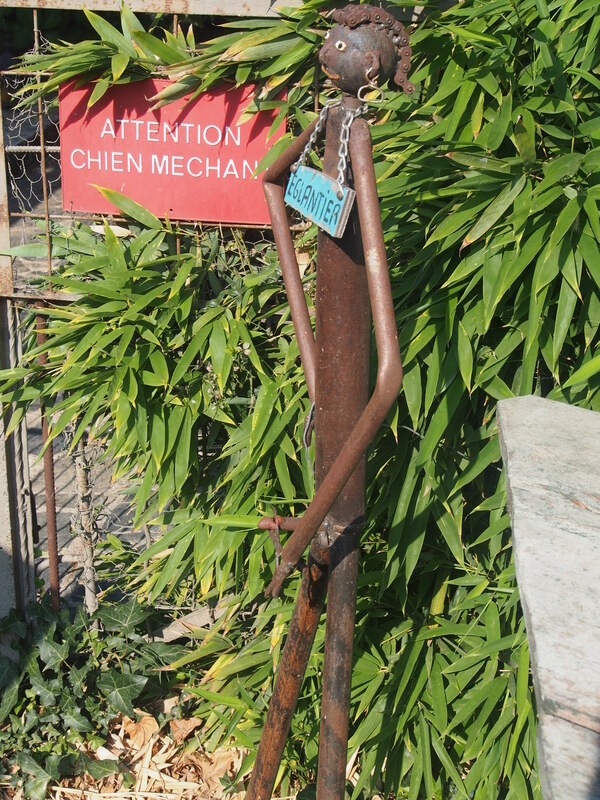 The chief engineer was Pierre-Paul Riquet and the canal was built during the time of Louis XIV. 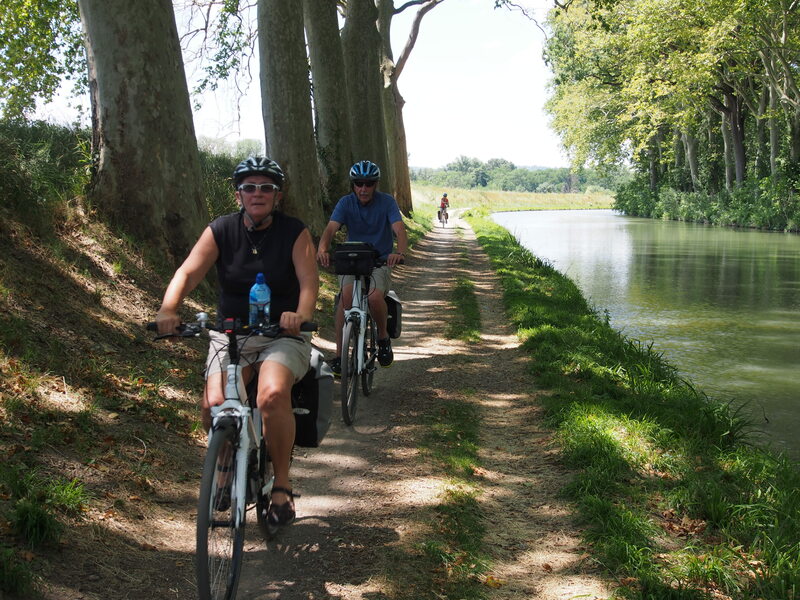 Today the Canal du Midi provides a recreational ribbon using the old towpath used for the horses to pull the barges. The paths now vary in quality but nearly 100% of the path is navigable by bicycle. Passing small towns and villages one always finds people out exercising on the path. 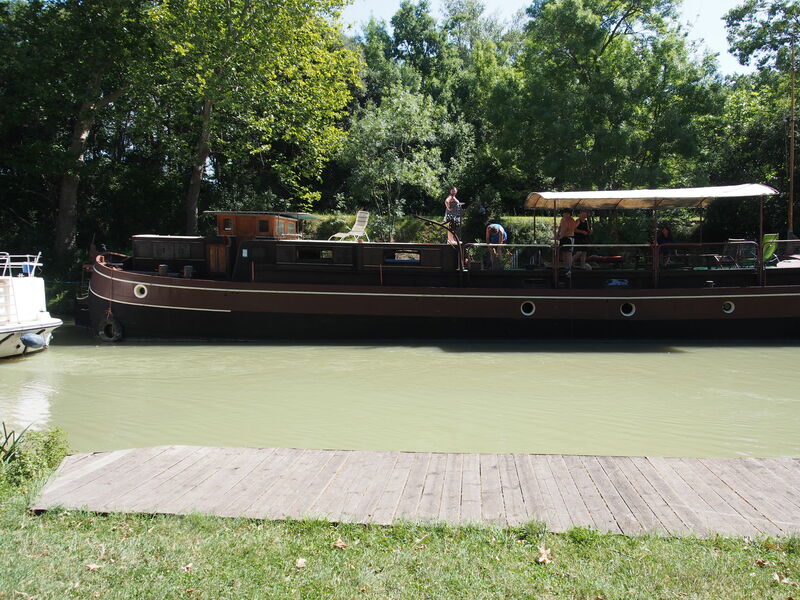 And for those wanting a water adventure there are always the barges you can rent to drive yourself or those that are more old world style and are like a fully crewed charter yacht. 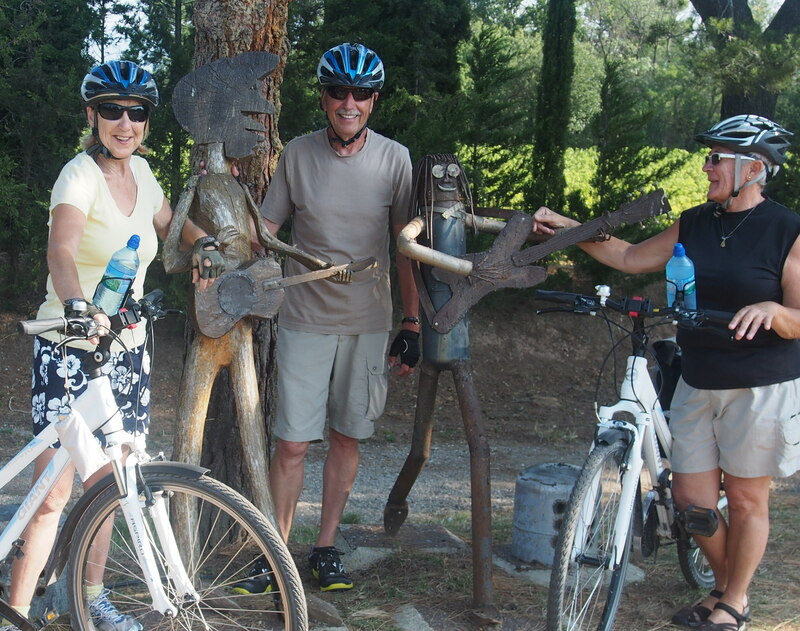 Our second day in the saddle saw bright sunshine, plane-tree lined canals, a relaxed pace and some wonderful scenery. Most amusing of all and my vote for best-managed lock on the system comes to the locks in the pictures below. Each of the locks is managed by a lockmaster. 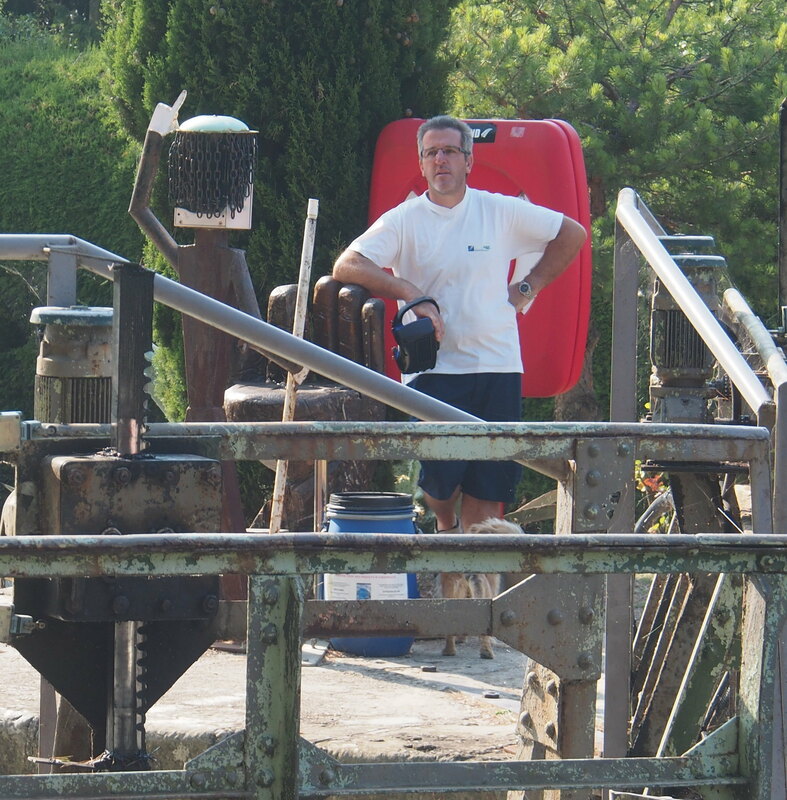 They have not automated the locks and the lockmaster usually lives on site and provides the required assistance to the traffic on the canal. 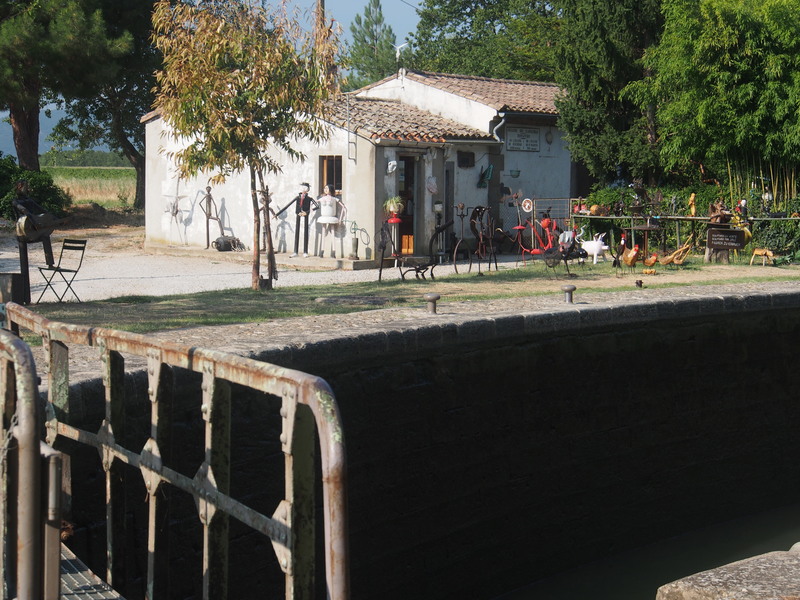 This particular lock had a lovely maintained garden and even a place to sit and have a picnic or a break. One of the best parts of cycling the canal was that we could always stop in a small town, pick up some items for lunch and cycle on till we found a comfortable spot along the canal to take a longer break, enjoy the scenery and the passing traffic and dig in to great French bread, pate, cheeses, wines, cold meats, pastries – oops, I shouldn’t go on about the food. But then there’s dinner! Before we could stop for dinner we, of course, had to find accommodation. 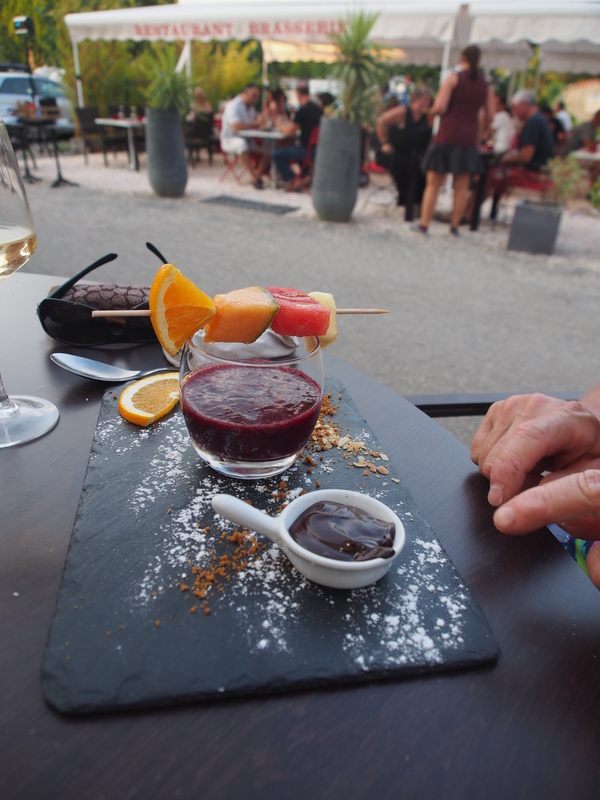 Apart from the first night at Marseillette (Gite Sainte Marie) we had no reservations. 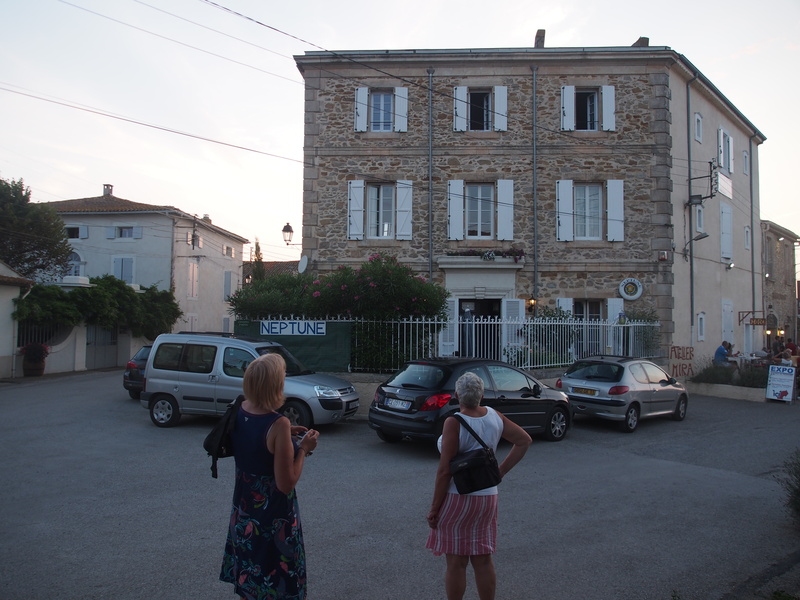 We never had a problem finding accommodation and on this night we lucked out in Le Somail and the second place we asked at had two rooms very close to the canal. Le Somail is one of a number of places on the canal where charter companies operate from. There is an extended basin, usually turn around places for the old commercial barges, where the charter barges are stored and where the companies rent from and supply the boats. 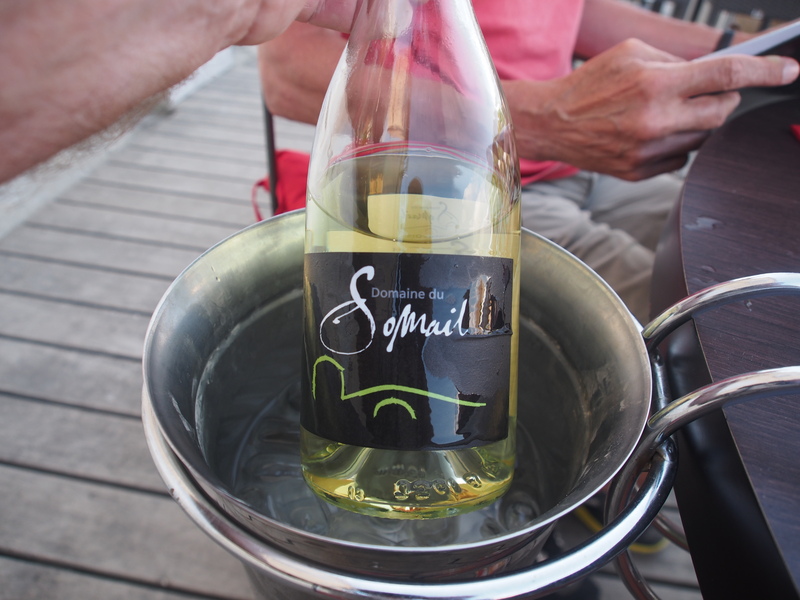 For us, Le Somail, was a welcome break. We arrived around 1700hrs, found Hotel Neptune, had a shower and before dinner took a walk through the town and down the canal to see the sunset. Then it was time for dinner. 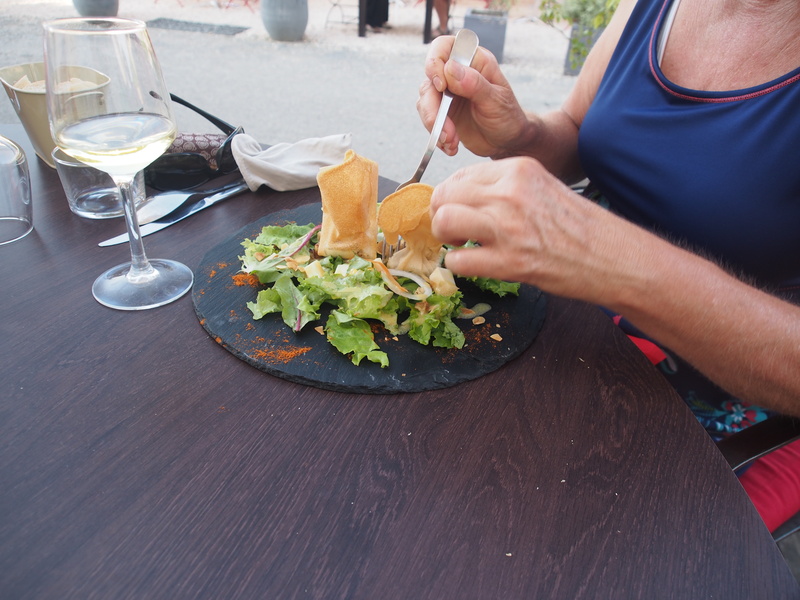 Wow – great little place just outside the hotel, music during dinner and a wonderful table d’hote – see picture below for the starter, the wine and the dessert which were all excellent. 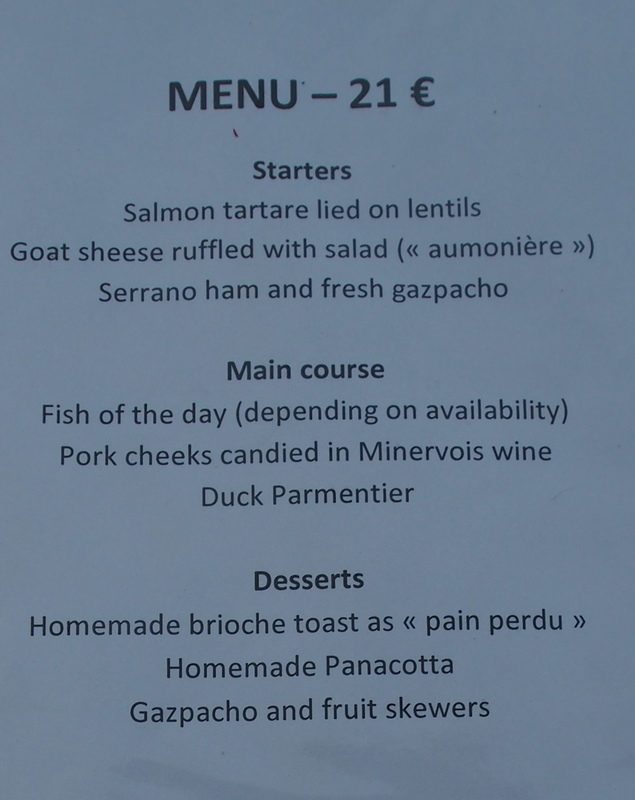 High marks to this restaurant, L’O a la Bouche, my mouth is watering. What a great way to end the second day on the canal. You two are amazing! Living the dream and letting me live vicariously through your blog.